Most of the population on earth today is uncomfortable discussing condoms, the first line of defense against HIV and unwanted pregnancies worldwide. However, the “Condom King,” Mechai Veravaidya, became such a notorious icon for condom endorsement that even today one may hear condoms being referred to as “mechais” throughout Thailand. He was instrumental in transforming Thai society’s general feelings toward condom use from discomfort to acceptance. 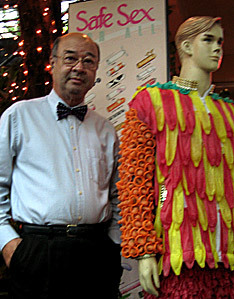 Mechai did not halt his achievements after educating Thailand about the use of condoms; to this day he continues to better villages throughout rural Thailand by promoting economic development, youth education, philanthropy, environmental sustainability and more. He first set foot in rural Thai villages in the mid 1960’s while overseeing public projects for the Development Evaluation Division. Feeling overwhelmed by the large number of underprivileged children crowding the areas, he performed a study and found that supply production could not keep up with the ever-increasing numbers of children. (Johnston) This situation inspired him to establish his first Non Governmental Organization (NGO)—Populations and Community Development Association (PDA)— develop Thailand’s comprehensive national HIV/AIDS prevention policy and other organizations to aid the efforts of PDA. In addition to funding, Cabbages and Condoms also support PDA’s efforts of condom familiarization by maintaining a condom-theme throughout the restaurants. The name, “Cabbages and Condoms,” stems from Mechai’s belief that condoms should be as common in the Thai community as cabbages are in their local cuisine. To enhance familiarity to condoms, Mechai has stated, “I wanted to take the seriousness and embarrassment out of birth control and make it a clean, fun thing.” (Johnston Interview)The restaurants act as a tool to introduce condoms in a variety of casual ways, including the presentation of condoms instead of after dinner mints and a plethora of condom decor throughout the establishment. The restaurants also house gift shops selling souvenirs handcrafted by local villagers. A portion of the revenue is sent back to the villages supplying the shop, which assists in empowering the impoverished residents. The VDP’s functional framework begins with the formation of a village committee—which is required to be comprised of 50% women— followed by the construction of an initial plan. Trained staff members guide the villagers by composing attainable goals and plans to achieve the goals. Once a plan is finalized, it is to be put into action. A Village Development Bank is established from the funds provided by sponsors in order to make the development plans possible. The money is managed by the local villagers, (with staff supervision), and micro-credit loans are bestowed upon small business owners once a satisfactory income-generating idea is proposed. The villagers’ ideas are put into action and once revenue is collected, the loans are paid back. If a business is unable to repay a small portion of a loan, labor can be done in place of monetary payment. VDP staff members are constantly working with the villagers throughout the process to guarantee its success. Mechai is currently working to provide the tools necessary to improve the quality of life for Thailand’s youth and promote responsible citizenship. His most up-to-date efforts are devoted toward youth philanthropy and education through the Mechai Virvaidya Foundation. The foundation, like PDA, encompasses complimentary associations, which include: the Machai Pattana School, the Green VIllage Toy Library (GVTL), and the Youth Philanthropy program. The school provides quality, free education while the GVTL teaches children of the next generation to act “community-minded and philanthropically,” while also gaining leadership and environmental stewardship. During one of his many interviews, Mechai Viravaidya stated, “Many organizations in the developing world, do excellent work providing health care…They are all trying to solve health problems that are the consequence of poverty, but they don’t address the root cause of poverty. Hence, they will never be sustainable.” (Melnick Interview) Mechai was speaking from his heart, as he did throughout all of his interviews, and it shows in the work he has accomplished. When he recognizes an issue, he never treats it in a superficial way. He aims to tackle each concern thoroughly by realizing that many issues are interconnected and are best resolved together. From promoting gender equality to providing water sanitation, Viravidya and PDA are constantly moving forward and discovering new angles to better the Thai community as a whole. The Mechai Foundation. 2011. n.p.<http://www.mechaifoundation.org/mechai_bio.asp> 1 May 2012. Population and Community Development Association. n.pApril 2012. <http://www.pda.or.th/e_index.asp> 1 May 2012. Ron Gluckman’s Reporting Page. Gluckman, Ron. Thailand’s Mr. Condom. 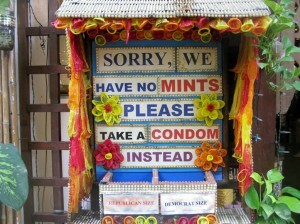 n.d. <http://www.gluckman.com/Thailand’s%20Mr%20Condom.html> 1 May 2012. Community Food Enterprises. CFE, 2009. <http://www.communityfoodenterprise.org/case-studies/international/cabbages-condoms> 1 May 2012. Health Affairs. Melnick, Glenn. From Family Planning To HIV/AIDS Prevention To Poverty Alleviation: A Conversation With Mechai Viravaidya. Project Hope; 2007. <http://content.healthaffairs.org/content/26/6/w670&gt; 1 May 2012.